When you’re dining at your favorite Japanese restaurant in New York, do you ever wonder how all of the ingredients come from Japan to your plate? 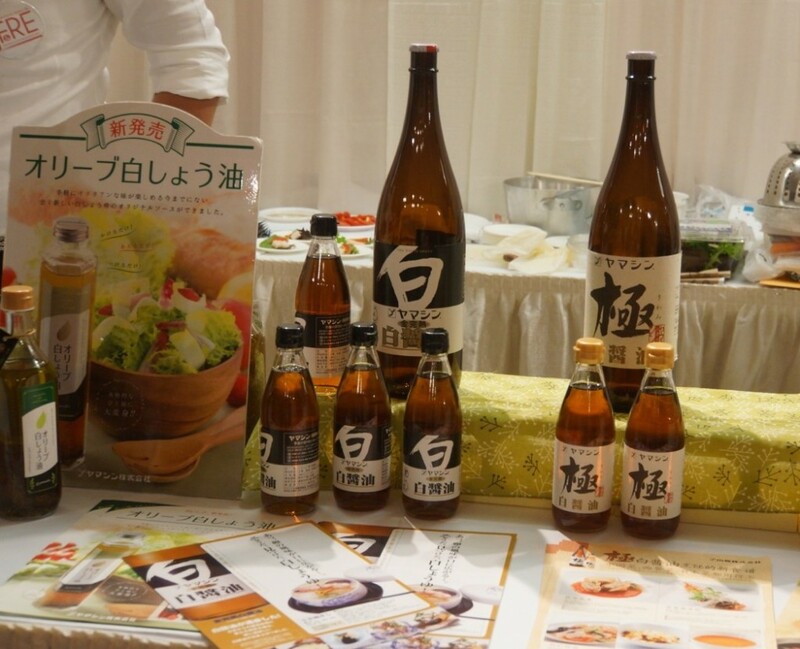 For more than 40 years, New York Mutual Trading, Inc. has partnered with Japanese vendors to distribute Japanese food, sake, and restaurant supplies directly to restaurants in the US, including more than 4,000 products throughout the tri-state area. 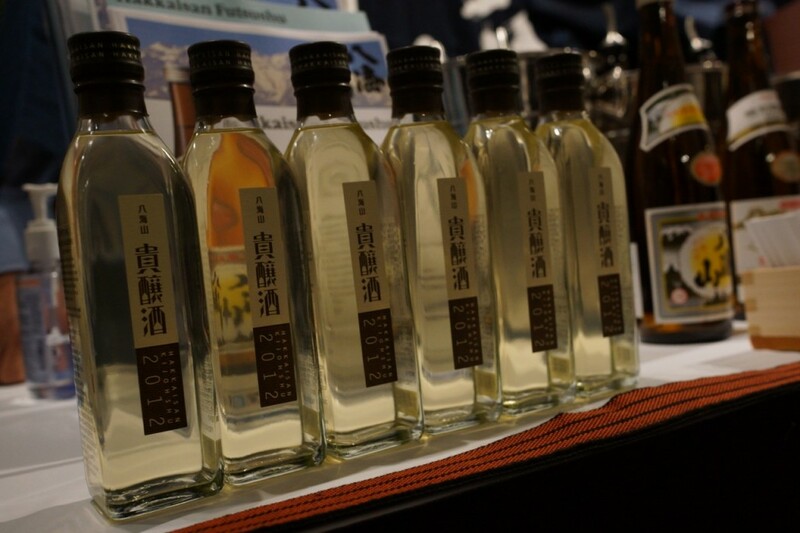 They also import and distribute more than 100 kinds of Japanese premium sake. 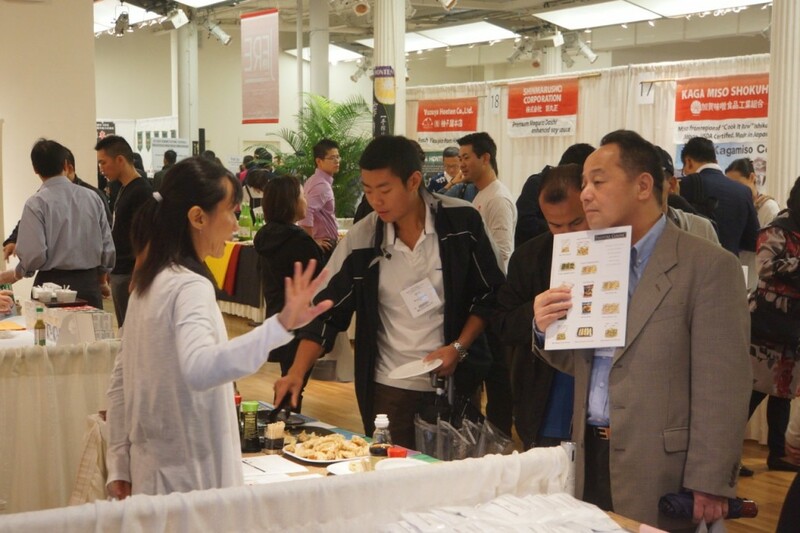 Each fall New York Mutual Trading, Inc. holds the Japanese Food and Restaurant Expo, a trade show for restaurant industry professionals who specialize in Japanese cuisine. 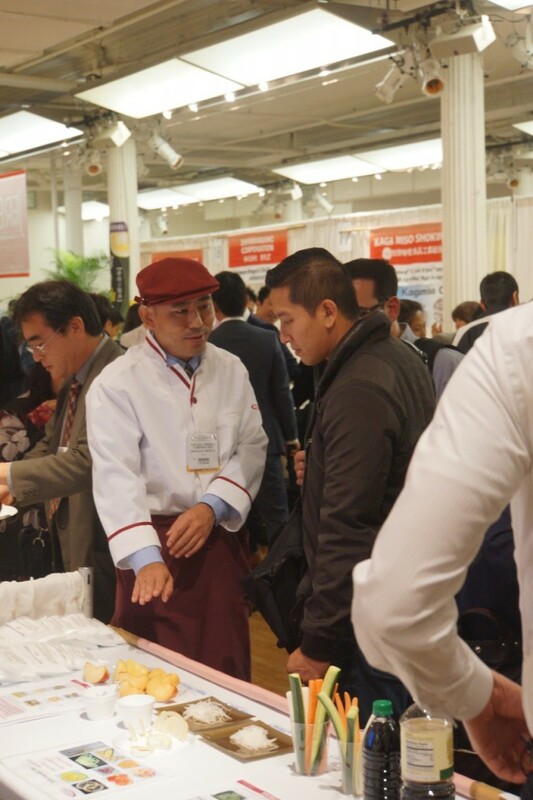 For an entire day the Metropolitan Pavilion is lined with booths where food, sake, and shochu vendors make sales to restaurant managers looking to find the latest trends in Japanese food and drink. 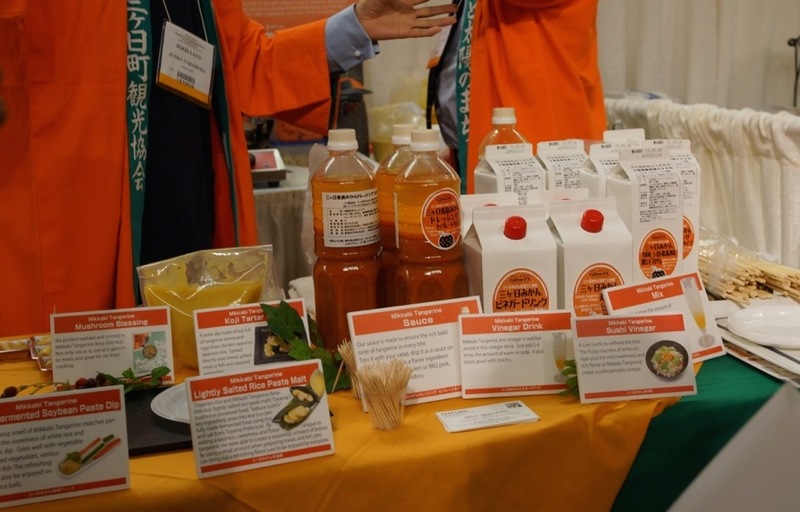 “Organic,” “pure,” “no preservatives,” “no chemicals,” “low sugar” continue to be buzzwords among health-conscious New Yorkers, and the Japanese food industry is hoping to capitalize on what they’ve considered their best practices for years: Producing healthy, all-natural food and food products that will appeal to the global market. As consumers, you may not necessarily see these items in your local grocery store, but chances are you’ll enjoy a meal that was prepared with them. Among the seminars, cooking demonstrations, and tastings, JapanCulture•NYC found nine particularly intriguing products that just might be coming to a Japanese restaurant near you. Shizuoka Prefecture is famous for its green tea production, but it’s also Japan’s third largest producer of a type of Mandarin orange known as mikan. Fuji Mikan Japan CáDew-FX Project uses the entire mikan – including the peel – to create their bold Mikkabi Tangerine Sauce, a salad dressing that you can use as a seasoning for basically any dish. Since mottainai (don’t waste) is an important expression – as well as practice – in Japan, the mikan that aren’t deemed pristine enough to become dressing will find new life as one of CáDew-FX’s many other products and side dishes, including sushi vinegar, a tartar dip, and a gelatinous dessert. Turning to foods that don’t contain chemicals or preservatives introduces the problem of keeping them fresh. Enter TREHA, a naturally occurring powder manufactured from starch. One of TREHA’s main functions is that it reduces wilting and maintains the crispness and color of leafy greens and other vegetables found in salad, says Tomonari Mozumi, Sales and Marketing Manager, Life Science Division of Nagase America Corporation. Add TREHA to uncooked rice, and it will increase fluffiness while reducing hardening. Add TREHA to desserts, and it will reduce sweetness while improving the quality of flavor. “My company has been brewing white soy sauce for more than 200 years, but no one in America has heard of it,” says Shinichi Okajima, President of Yamashin. White soy sauce is made with 90% wheat and 10% soy beans – that ratio is 50-50 with standard soy sauce – making it low in sugar and sodium. Okajima says that process doesn’t compromise taste; the resulting mellow flavor is great for Asian and Western dishes. Professional chefs prefer white soy sauce because its transparency preserves the natural colors of other ingredients. By now every sushi and sashimi lover knows that powdered wasabi has nowhere near the flavor as the fresh version of the pungent Japanese herb. Japanese company Kinjirushi was at JFRE to show off its Hon Wasabi, a frozen grated wasabi. After grating 100% fresh wasabi, Kinjirushi immediately freezes it without food coloring or additives. It can be frozen, thawed, and frozen again for almost one year, retaining the aroma and flavor of pure wasabi. 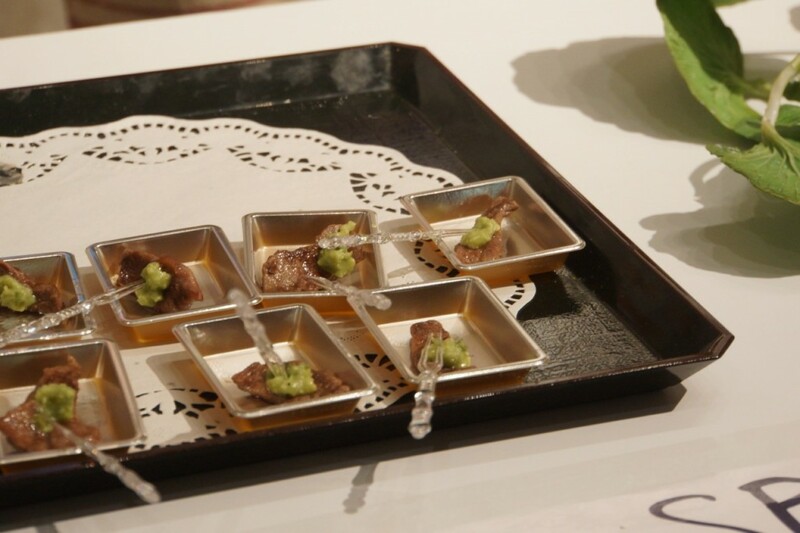 Oh, and Kinjirushi served samples of its Hon Wasabi atop not fish, but beef, so clearly they want New Yorkers to know that wasabi isn’t just for sushi. Frozen sushi from Polar Star Co., Ltd. This does sound rather unusual, but one restaurant industry professional raved about Polar Star Co. Ltd.’s frozen sushi, saying it is “better than 90% of the sushi restaurants in New York.” The microwavable sushi is frozen and stored in a hermetically sealed, vacuum-packed bag. 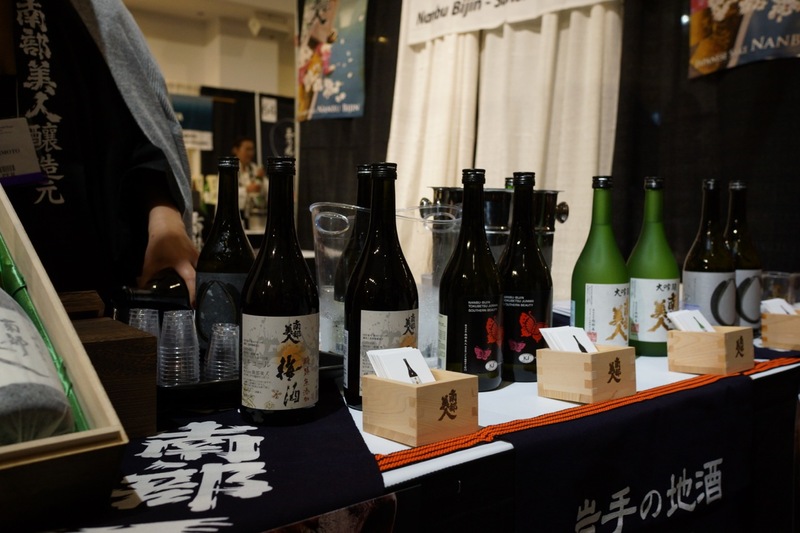 For years sake brewers have been trying new tactics to present quality sake to a broader audience. This is equally true of Hakkaisan Brewery, who introduced four new products at JFRE, most notably its sparkling nigori and kijoshu. “The Hakkaisan sparkling sake is great with fruit or as a dessert sake, but it’s also great to pair it with spicy dishes because it cuts down on the heat,” says sake samurai Timothy Sullivan, founder of urbansake.com and official brand ambassador of Hakkaisan. The Niigata-based brewery has also developed kijoshu, a type of sake that replaces water with sake during the brewing process. It is also aged for two years. The result is a refreshing flavor that has a nice balance of sweetness and acidity with a clean finish that doesn’t linger longer than it should. Finally, a plum sake that isn’t so sweet that it makes your lips pucker. Iwate-based Nanbu Bijin Brewery doesn’t add any sugar to its umeshu, instead relying on the natural sweetness of the plums and koji. Yes. Brace yourself for an unexpected burst of umami. 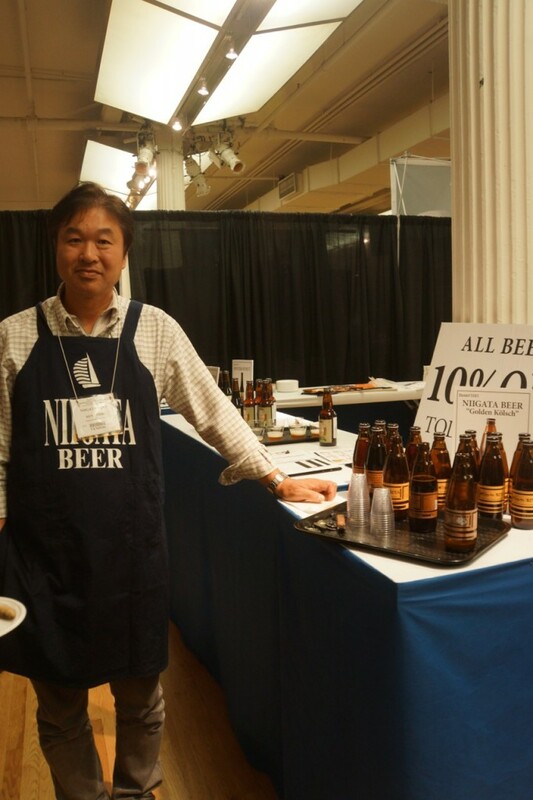 Niigata Beer Company executive Ken Usami says he cultivates the truffles that are found in his area and has used them in the brewing process of his craft beer. The aroma has immediate impact, and the flavor is something worth trying. But you probably wouldn’t go through a six-pack of this stuff in one night. The world is used to beer with pumpkins and blueberries, so why not truffles? 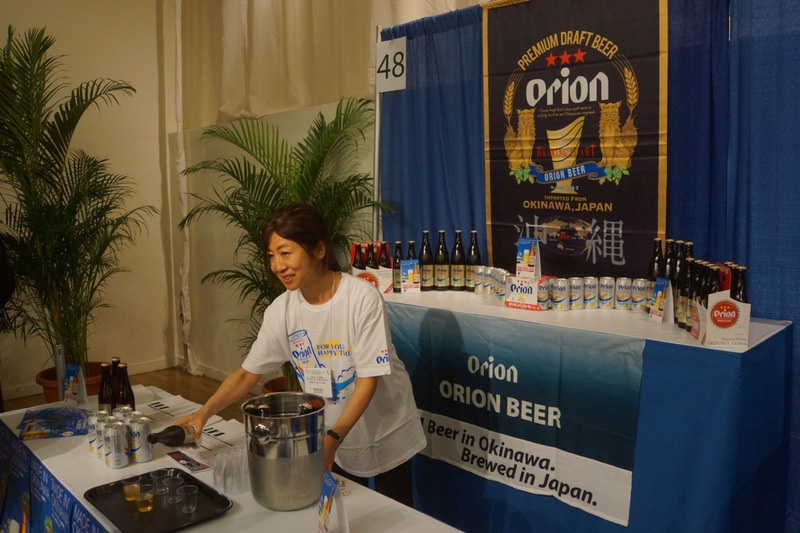 The beer brewed exclusively in Okinawa, the southernmost prefecture of Japan, is already available in New York restaurants, but Ryota Higa, who is in charge of international sales at Orion, wants many more people to enjoy its light and refreshing taste. Orion is brewed only in Japan, unlike major breweries Asahi, Sapporo, and Kirin, which are produced in Canada and LA and distributed around North America. 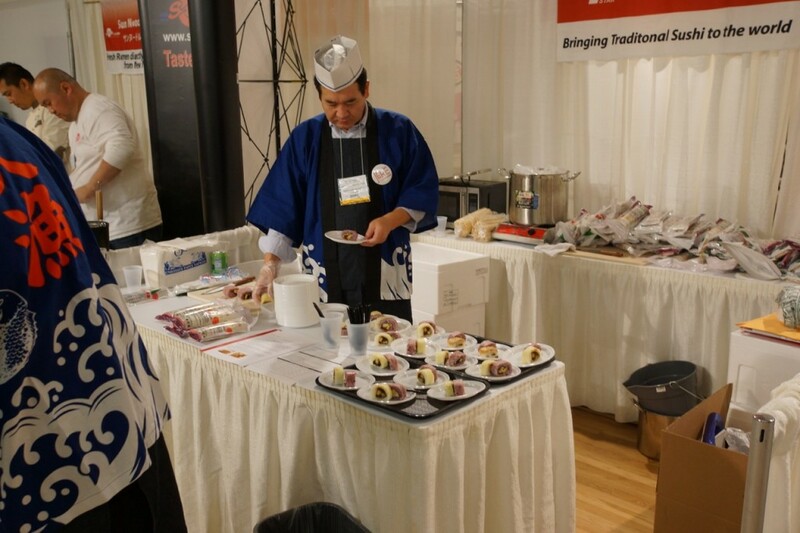 To see more pictures from New York Mutual Trading, Inc. Japanese Food and Restaurant Expo, please visit JapanCulture•NYC’s Flickr account.